(CN) – Hotly contested Democratic primary races for New Mexico governor and an open Albuquerque-area congressional seat drove higher than usual voter turnout in New Mexico, while Montanans came out in force Tuesday to vote on U.S. House and Senate races. The New Mexico Secretary of State’s Office reported that 97,917 people cast primary ballots during the early voting period ahead of today’s primary. In 2014, about 202,000 voted in the state’s primary, and this year projections are that around 30 percent of the state’s registered voters will cast a ballot in the primary. Three candidates vied for the Democratic nomination for governor of the Land of Enchantment: Congresswoman Michelle Lujan Grisham, state Sen. Joseph Cervantes and former media executive Jeff Apodaca. The winner will take on Republican contender and U.S. Rep. Steve Pearce. By late Tuesday evening, the Associated Press projected Grisham as the winner of the Democratic primary. New Mexico’s next governor will inherit a lagging state economy and a troubled public education system. A plan to redistrict the state in 2020 raises the stakes even higher for the gubernatorial election. For lieutenant governor, Democrats Rick Miera of Albuquerque, Billy Garrett of Las Cruces and state Sen. Howie Morales of Silver City ran in a three-way race with Morales receiving 47 percent of the vote. Republican Michelle Garcia Holmes will be Pearce’s running mate. In Albuquerque, five Democrats are battling for a shot at the 1st District seat, which has been held by the party since 2009. The candidates are former state Democratic Party chair Debra Haaland, former U.S. Attorney Damon Martinez, former law school professor Antoinette Sedillo Lopez, immigration and family law attorney Damian Lara, and business consultant Paul Moya. As of 10 p.m. EST, the AP projected Haaland as the winner of the primary. Lifelong Albuquerque resident Paul Yazzie emerged from the polling place with his ‘I Voted’ sticker placed on the front of his infant daughter’s dress, and was proud to tell Courthouse News he’d cast his vote for Deb Haaland. “We have a real chance at getting the first Native American woman in Congress. I wanted my daughter to be a part of that,” Yazzie said. 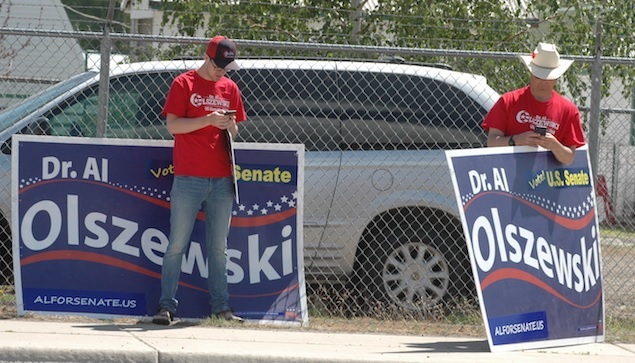 Officials in Montana say they’re also seeing near-record voter turnout for a primary election. Going in to Tuesday, about 190,000 residents had already voted by absentee ballot. This year’s absentee ballot return is just short of the 205,000 ballots received in the 2016 primary, but far above Montana’s 2014 primary election, in which 149,000 absentee ballots were cast. The 2017 special election saw roughly 280,000 absentee ballots, according to Montana Secretary of State Corey Stapleton. Voter turnout in Montana has been near the highest it’s ever been for a primary. Stapleton said he predicted a voter turnout of around 38 percent. The last non-presidential primary in 2014 drew a turnout of around 33 percent. In this primary, Montanans will choose challengers for the state’s single U.S. House seat, held by Greg Gianforte, R-Montana, and the Senate seat held by Democrat Jon Tester. A total of 13 challengers made the ballot to unseat incumbents Tester and Gianforte. Six Democrats and one Green Party candidate are challenging Tester, who has held the Senate seat since 2006. On the Republican side, businessman Troy Downing, former state court judge Russ Fagg, physician Al Olszewski, and state auditor Matt Rosendale seek to advance to the general election in November against Tester. Rosendale led his opponents to win the Republican primary Tuesday. He faces Jon Tester, who beat out his Democratic challengers. Rosendale, as the state auditor, had the advantage of name recognition and had been seen as the early front-runner in the election. He gained financial backing from national Super PACs. Montana is traditionally a Republican state, which Trump carried in the 2016 presidential election. However, the state has a Democratic governor and Republican-controlled Legislature. Only two Republicans have held Montana’s Senate seat in the history of the state, but both of Tester’s elections have been close calls. He defeated incumbent Conrad Burns in 2006 and challenger Dennis Rehberg in 2012. Tester is among 10 Senate Democrats facing re-election in states won by Trump in 2016. In Montana’s U.S. House race, six Democrats are seeking to unseat Gianforte, who was elected in a May 2017 special election called after Rep. Ryan Zinke resigned to become Trump’s interior secretary. Gianforte was caught up in turmoil the night before the special election when he was arrested and charged with misdemeanor assault of a reporter from The Guardian. Candidates in the Montana House race include Democrats John Heenan, Grant Kier, John Meyer, Lynda Moss, Jared Pettinato, Kathleen Williams and Green Party candidate Doug Campbell. As of 10:45 MDT, Williams was barely leading Heenan in a close race, with 23,172 votes to Heenan’s 22,526. The winner will face Gianforte in the Nov. 6 general election. Resident Scott Plotkin moved to Kalispell three years ago from California. He sees Gianforte as beatable in November.